Celebrate Recovery is a biblical and balanced program, based on the actual words of Jesus rather than psychological theory, that helps us overcome our hurts, hang-ups, and habits. 20 years ago, Saddleback Church launched Celebrate Recovery with 43 people. This program was designed to help those struggling with hurts, habits and hang-ups by showing them the loving power of Jesus Christ through a recovery process. Celebrate Recovery is now in more than 20,000 churches worldwide, including Big Valley Grace Community Church. This is the meeting before the meeting and the meeting after the meeting–it’s just as important as the other meetings. It is where we start to build healthy relationships. We have the chance to meet potential sponsors, develop support and accountability teams, and cultivate healthy friendships. Our CR food team barbecues (summer menu) and prepares all sorts of delicious and creative meals every week. We also open our Solid Rock Cafe at the end of open share in the church lobby, where we serve desserts including cake, pies, and fresh fruit. 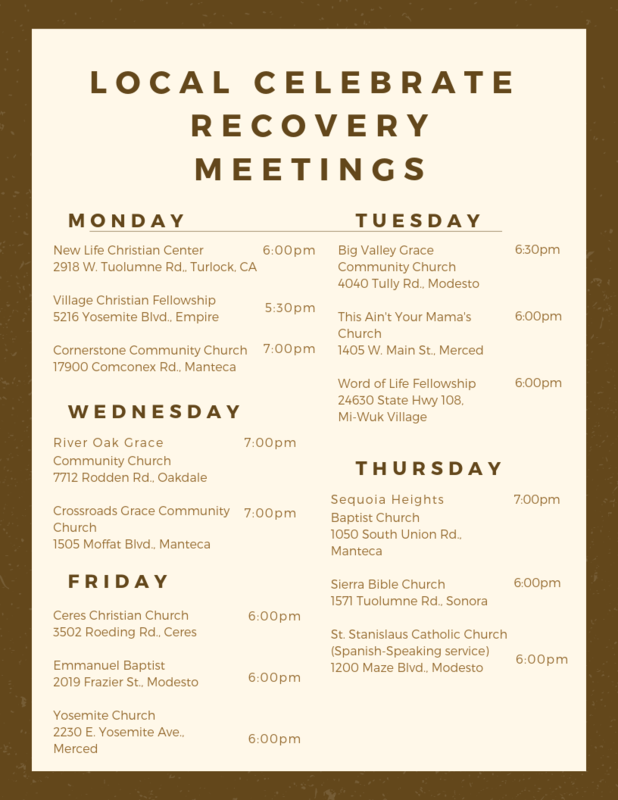 This is a great opportunity to gather as a Recovery community. We worship God with our Celebrate Recovery band, receive teaching on the 12 steps and their biblical comparisons, and hear testimonies from those who have walked the road of recovery. 1. Keep your sharing focused on your own thoughts and feelings. Please limit your sharing to 3-5 minutes. 2. There will be no cross talk, please. Cross talk is when two individuals engage in dialogue, excluding all others. Each person is free to express feelings without interruption. 3. We are here to support each other. We will not attempt to “fix” one another. 4. Anonymity and confidentiality are basic requirements. What is shared in the group stays in the group. Our heart goes out to first-timers! If this is your first time, we invite you to our first-time guests’ group in the Altar Room after the large group meeting. We give direction to the Altar Room every week during large group announcements. Contact Us for more information. For information about Celebrate Recovery, contact us. These are gender-based groups (not issue specific) that meet weekly to go through the four Celebrate Recovery participant guides which include the 12 steps and their biblical comparisons. These in-depth studies usually takes 10-12 months to complete, and are where we truly begin to move forward in healing and freedom. For information about Step Studies, contact us. Celebrate Recovery is a whole family ministry. For children birth through kindergarten: childcare available. What we might need recovery from? You can subscribe to our weekly podcasts via iTunes!